Chocolate pudding has long been one of my favorite desserts, from the time I sat at the formica table as a child and ate it out of melamine bowls (ours were a robin’s egg blue) to today. If you’re not loving chocolate pudding, it’s likely you’re eating the premade or the mix, both of which pale in comparison to the real thing. Mom used the mix, but as a teenager, I noticed the recipe for on the back of the cornstarch box – it was a revelation. I could make pudding right now even if we didn’t have a box of pudding in the cupboard? It was ok, but not great, and it wasn’t until I began reading my grandmother’s cookbooks that I discovered why. The simple cornstarch pudding lacked the structure, richness and body of one that included egg yolks. If only we’d had the internet back then! Why make home-made when you can buy in a plastic cup, shake together or use a mix? Taste – beautifully rich chocolate taste. It’s not really all that much work, and best of all can be whisked up any old night you happen to feel like it from pantry ingredients – especially dangerous if you like it still warm. These are small servings so you might want to double. Using plain old cocoa gives a gorgeous milk chocolate flavor, a blend like Hershey’s special blend, half plain cocoa, half Dutch process really brings home the chocolate flavor. A full Dutch process cocoa, to my mind, is a bit overwhelming. Try home-made, even once, and you’ll never go back. This is marvelous topped with whipping cream. Put milk, sugar, cornstarch, salt and cocoa in a medium saucepan. Bring to a simmer, over medium-high heat. Meanwhile, whisk egg yolks, and vanilla in a bowl. Gradually whisk about a cup of the hot milk mixture into the egg mixture. Return to the saucepan and cook over medium-high heat whisking constantly, until the pudding comes to a full boil. Reduce the heat to maintain a simmer, and continue whisking until thick, about 2 or 3 minutes more. Remove from heat and add butter and vanilla. Strain mixture, using a spatula to force through the strainer, discarding any solids. Pour the pudding into 4 small cups. Cover with plastic wrap and refrigerate for at least 4 hours or overnight until set. I often use 1 or 2 percent milk, rather than buying a richer milk for this recipe. If I am using whipping cream, and have it on hand, I may replace about 1/4 cup of the lesser milk with the whipping cream. I don’t mind going a little less richer, though, for an everyday recipe like pudding. The egg whites shouldn’t go to waste: incorporate them into scrambled eggs, make another recipe or freeze until ready to use. A few cents could be saved here by eliminating one of the eggs and the butter, and it will still be very good. The price of the pudding would drop from $1.09 to $.77. Cornstarch: This is one of those baking items best bought around the winter holidays when baking items are at their least expensive and coupons are available. Look for great prices at your drugstore, too. Cost for 4 teaspoons: about two cents. Milk: Buy on sale – unopened it keeps a bit past it’s “sell by” date – then you can pick up one for the beginning of the week, and another at the end of the week for the week following. In our area, it is often on sale for $2.99 a gallon. Be careful with your milk, and even opened it will last a lot longer – pour, lid and put away, don’t bring it to the table or leave it on the counter while you eat dinner or down your cereal and you’ll notice it stay fresh last MUCH longer. We’ve cut way back on dairy, as most health experts suggest – putting it away helps with that, too. Cost for two cups, about 16 cents. Eggs: Stock up on eggs when they’re inexpensive, normally during Holiday weeks. Low prices in my area range from free (often with other purchases) to anywhere from $1.89 for 18 eggs. They last for weeks in the fridge – The date on the container is a ‘buy’ date, and you can expect them to last a good four to six weeks past that date. If you pick up two or three packages when they’re at their low, you’ll rarely need to pay full price. Refrigerate right away and never store in the door; eggs keep best in a colder part of the refrigerator, in their own box. (Then put your partially used vegetables in the door where you’ll see them and remember they need to be used ASAP – the half a bell pepper or onion, etc.) In doubt about an egg? If it floats in water, discard, just to be on the safe side. If they float, it means the egg inside is drying out, not that it is bad in any way. Cost for 3 eggs, about 30 cents. Cocoa: Just like with almost any baking product, try to buy during the Holidays that most often have such items on sale, from shortly before Thanksgiving through New Years. Watch for sales during Valentine’s Day week and Easter, as well. Use a coupon, too, if available. I’m afraid I’ll need to estimate the cost, about 25 cents. Vanilla or other Extracts: Believe it or not, liquor is often cheaper than vanilla or many extracts, but there is a strategy to buying on the cheap: for the past few years McCormick has had great coupons combined with Catalina offers (buy so many, get a coupon back to get so much money off your next grocery purchase, always in the Spring.) Check your coupon matching sites weekly so you don’t miss this – it’s often unadvertised. Your store will likely have the best sales, then, too. I never thought of Vanilla or extracts as being seasonal before…but now I get free if I buy several smaller packages. I’ll count it as about 10 cents. Butter: A bit of a splurge, cost and calorie wise – but for taste and health, I’d rather use real butter than trans fat laden margarine or oils. Yes – they do have trans fat, even if the label says they don’t. Harvard, for instance, says unequivocally: “The key to a healthy diet is to substitute good fats for bad fats and to avoid trans fat.” While butter isn’t a healthy fat, many feel that trans fat is worse than saturated. Buy on deep specials, often around the holidays with store coupons. I shoot for $2.50 a pound and freeze, where it stays fine for months, but haven’t seen this price for awhile. At nearly $5.00 a pound, butter is about 22 cents in this recipe. Sugar: Look for sugar on sale, which usually happens around the holidays. While any holiday generates a sales price, the best sales are generally from Thanksgiving to Christmas, when coupons are abundant. Check out Aldi for your sugar; their prices are generally great. 1/2 cup is about 4 cents. I prefer NOT to put the plastic directly on top of the pudding, but instead to let a thick top part form. It seems I am in the vast minority, and most people hate a thick chocolate layer on the top of their pudding. This entry was posted in Click here for Fabulous Food Posts and tagged Chocolate, Desserts, Easy Recipe, Frugal Hausfrau, Pudding. Bookmark the permalink. Hi there, I am so happy you came by Food on Fifth and left your comment as that is how I found your wonderful and very fun blog. I love your money saving tips and recipes. Looking forward to keeping up with your cooking life. Best to you. Thanks Teresa, for stopping by and commenting – it took just one peek at that Tomato, Bacon and Spinach Pie to turn me into a die hard “Food on Fifth” follower! I’m looking forward to exploring more! You’ve certainly raised the bar for us bloggers. You know how on cartoons sometimes a character will look at another character and a little bubble comes up and shows food? Like the first character might look at a chicken and see a cooked chicken on a plate? I was at my sister’s and the neighbors were neglecting to pick several tomatoes on the backside of their garden. I kept looking at them, and every time I did, your tomato and spinach pie popped into my head! Thanks for commenting, and price may vary a bit by area, but so often home-made costs so much less than we’d expect! I haven’t bought a box of pudding for decades, but my guess is the box is probably more than home-made, but regardless this pudding is so decadent it would be a bargain at almost any price! And I forgot to say, I’ve been really enjoying your blog! So creative and fun! I used to make the box pudding and eat the whole thing when I was a teenager. Back when I had a high metabolism. But I agree with you, homemade is the way to go. And this looks delicious. I’m with my sister, tonight, who told me that she remembered the chocolate pudding. Tapioca, too. Both of us have a little tiny space at the top of our front teeth, and when I said I used to like to squirt the tapioca through it, she laughed and said she did, too. How strange we were/are! And she likes the thick layer on top of pudding that you get by not covering it. And these were just after school snacks! Of course we walked or biked everywhere and swam all summer. Oh the stuff we used to eat! We are probably well preserved. 🙂 But yes we used to bike for hours! 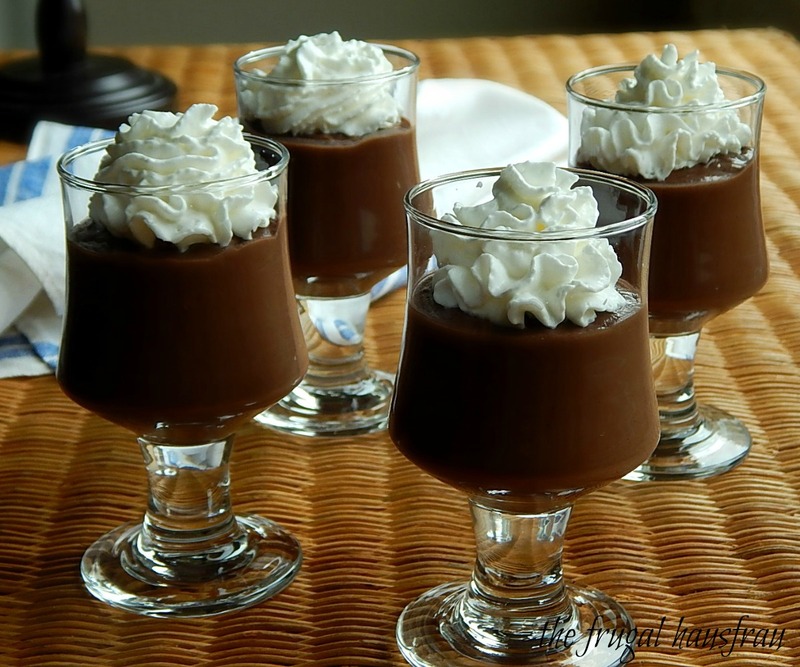 Love chocolate pudding!! Looks delicious. Me too! I was lucky my son and his girlfriend were here to eat most of it!